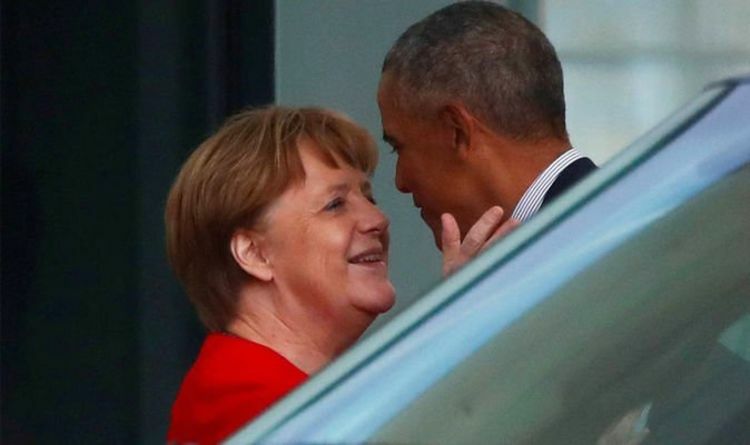 Ms Merkel was pictured touching Mr Obama warmly on the cheek as the pair met in Berlin. They sat down for talks at Ms Merkel’s office and the former US president could be seen through the window laughing. It is not known what they discussed but Mr Obama’s successor Donald Trump is likely to have been mentioned. Ms Merkel and Mr Obama later emerged together before the German chancellor waved Mr Obama off. The former US president is part-way through a three-day visit to Germany. On Thursday he took to the stage at the World Leadership Summit in Cologne. Tomorrow he is due to meet with a group of 300 young people from across Europe. It comes after his last visit to Germany in 2017. The former US president and the German chancellor worked closely together for a number of years and Mr Obama previously described Ms Merkel as "one of my favourite partners throughout my presidency". His final phone call before leaving the White House in January 2017 was to the German leader. Mr Obama thanked her for her “strong, courageous and steady leadership”. Mr Obama served two terms as America’s president from 2009 to 2017. Ms Merkel has been Germany’s chancellor since 2005 and she has worked with three US presidents. But last year she confirmed that she would not stand for re-election when her term ends in 2021. She also stepped down as the leader of the Christian Democrat Union (CDU) party in December following heavy election losses.